It's official - England's demolition of Australia in Melbourne in 2010-11 is your favourite Ashes tour moment. Of the 25,000 BBC Sport users who voted online, 31% chose England's perfect Boxing Day as their highlight from more than a century of Ashes contests. Steve Harmison's first-ball wide in the first Test in 2006-07 was the second most popular choice, while England's three-run win in Melbourne in 1982 pipped the infamous 1932-33 'Bodyline' series into third. Win the toss, put them in, bowl them out, and overhaul their total without losing a wicket. Is this the nearest England's travelling fans will ever come to a perfect first day? England captain Andrew Strauss was vindicated in fielding first as pace bowlers Chris Tremlett (4-26), James Anderson (4-44) and Tim Bresnan (2-25) gave a seam and swing bowling masterclass to bowl Australia out for 98, their lowest Test score against England at the MCG. All 10 wickets fell to catches behind the wicket - six to wicketkeeper Matt Prior and four to the slip cordon. It meant England still had 47 overs to face. But Strauss and Alastair Cook did so with little fuss, ending the day on 157-0 as Australia's pace attack misfired and Mitchell Johnson was taunted mercilessly by the Barmy Army. England went on to win by an innings in little more than four days to retain the Ashes. What they said: "In Andrew Strauss' wildest dreams, he couldn't have hoped it would turn out like this." BBC cricket correspondent Jonathan Agnew. "The Harmison ball" - three words that still strike fear into any England supporter. Confidence was high among the thousands of fans who travelled down under following the euphoria of recapturing the urn in 2005. After Australia chose to bat in the first Test in Brisbane, skipper Andrew Flintoff threw the ball to Steve Harmison, who had terrorised Australia's top order on the morning of the first Test in 2005. Harmison charged in at Justin Langer... and bowled a delivery so wide that it was caught by Flintoff at second slip. It is the worst - and most famous - first ball in history. The tone was set. Australia racked up 602-9 declared en route to a 277-run win at the Gabba and romped to a 5-0 whitewash. What they said: "I froze. I let the enormity of the occasion get to me. My whole body was nervous. I could not get my hands to stop sweating." Steve Harmison. This was one of the closest Tests of all time - only 10 runs separated the scores of the four innings. Australia had two days to score 292 for victory, and were still 74 short when last man Jeff Thomson joined Allan Border. England captain Bob Willis spread his field for established batsman Border, offering him singles so England could target tailender Thomson, but the pair chipped away at the target, and eventually, with four runs needed, he turned to England's talisman. "Ian Botham is going to have one last crack at Jeff Thomson," Henry Blofeld told Test Match Special listeners. Thomson flashed at a wide delivery, the ball flew off the edge, second slip Chris Tavare could only parry the ball, but Geoff Miller ran behind him at first slip to complete the catch. It was Botham's 100th wicket against Australia, and England had sneaked home. What they said: "It became heart-stopping stuff. We were down to the last throw of the dice when I handed the ball to Botham." England captain Bob Willis. The 'Bodyline' series of 1932-33 has gone down in history as one of the most famous, or infamous, Test series after England captain Douglas Jardine devised a 'leg theory' strategy to nullify the threat posed by Australia's Don Bradman, the best batsman in the world. His weapons of choice were Nottinghamshire fast bowlers Harold Larwood and Bill Voce, who bowled short-pitched deliveries at the batsman's body with several close fielders posted on the leg side. The biggest flashpoint came at Adelaide. Larwood struck captain Bill Woodfull over the heart, while wicketkeeper Bert Oldfield retired hurt with a fractured skull. England cruised to victory, but the rest of the game was overshadowed by a rancorous exchange of cables between the Australian board, which considered England's tactics "unsportsmanlike", and the MCC, which furiously demanded the word be retracted. The controversy led to the Laws of Cricket being changed to limit aggressive and dangerous bowling. What they said: "In Australia to this day, the word Bodyline carries the stench of underhand or unsportsmanlike behaviour, with the series regarded as Australian cricket's most controversial." David Studham, Australian National Sports Museum. If ever a series deserved to be named after one player, this was it. Mitchell Johnson's figures alone make scary enough reading: 37 wickets at an average of 13.97 in five Tests. Imagine what it was like to face him from 22 yards, a growling, moustachioed wrecking ball charging in and producing what several respected judges said was the fastest bowling they had ever seen. Johnson's 7-40 in the first innings in Adelaide were his most impressive figures, but perhaps the psychological damage inflicted in the series opener in Brisbane was even more telling. It said much for the hold that he held over the England batsmen that a second 5-0 whitewash in three Ashes tours looked likely long before the series was over. What they said: "I heard Stuart Broad, James Anderson and Graeme Swann say they were scared. When you've got that, you know that a bloke in the other team is doing damage." Former England batsman Kevin Pietersen. Australia won the toss in the final Test in Sydney and the first day was dominated by a stand of 190 by the Waugh twins as Mark (121) and Steve (96) made hay on their home ground. However, there was to be a brief moment of magic for England's travelling fans. Darren Gough had been a mainstay of England's attack as they struggled for most of the 1990s, but the Barnsley pace bowler wrote his name into Ashes history at the SCG. With three deliveries left in an over, Gough had Ian Healy caught behind with one that climbed; Stuart MacGill had his middle stump removed by a searing yorker that swung out late; and, roared on by the England fans, Gough pegged back Colin Miller's off stump with another. What they said: "The ball to Miller ended up being probably the best I've bowled all series." Darren Gough. A squad containing Ian Botham, David Gower and Allan Lamb was never likely to struggle on the social side of an overseas tour. The 1986-87 series proved to be successful on and off the field for England, who made a mockery of this comment in one newspaper: "There are only three things wrong with this England team. They can't bat, can't bowl and can't field." Mike Gatting's side confounded their critics to win the series 2-1 and retain the urn. Botham, as ever, reserved his best performances for the 'old enemy', while opener Chris Broad - six months after son Stuart was born - hit centuries in three successive Tests. Off the field, the team partied hard. Pop star Elton John spent time with the squad for much of the tour, and acted as DJ for the victory party after the Ashes were clinched in Melbourne. The traditional Christmas Day fancy-dress party, a staple of winter tours in those days, was particularly memorable, the star of the show being seam bowler Phil DeFreitas dressed as singer Diana Ross. 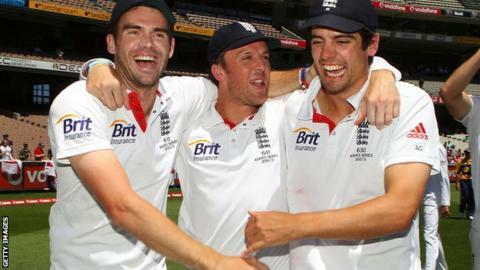 It was England's last Ashes success for some time - they would not win it again until 2005. What they said: "David Gower and Allan Lamb were having this drinks race. When we got on the coach, Gower was spewing out of the window, Lamby was stopping the driver to go to Pizza Hut." Phil DeFreitas. In the Melbourne Test of 1998, rain meant Boxing Day was lost to the weather before 12 wickets fell on day two, 10 on day three, and a staggering 18 on day four - a day that belonged to Dean Headley. Australia were cruising on 103-2, chasing only 175 for a victory that would have given them a 3-0 series lead. But pace bowler Headley had Justin Langer brilliantly caught by a diving Mark Ramprakash at square leg during a blistering spell of 5-9 that left Australia teetering on 140-7. Australia claimed the extra half-hour as Steve Waugh inched the hosts to within 14 runs of their target, at which point Headley had Matt Nicholson caught behind. Darren Gough claimed the final two wickets in the following over to wrap up a pulsating 12-run victory, while man of the match Headley finished with a career-best 6-60. It ended a marathon four-hour session at the end of a day that featured eight hours and two minutes of play - the longest in Test history. What they said: "Headley's irresistible spell on the final day at Melbourne provided the highlight of the tour." Wisden Cricketers' Almanack. Captain Steve Waugh was under pressure for his place and Australia were in the midst of a collapse when he arrived at the crease at 56-3, just before tea on day two of the fifth Test in Sydney. But he raced through the gears, passing 50 from only 61 deliveries and becoming only the third player in history to reach 10,000 Test runs. He made it to 95 with one over of the day remaining - to be bowled by off-spinner Richard Dawson. An expectant SCG - his home ground - chanted Waugh's name as the over began with three dot balls. Waugh scored three off the fourth. Adam Gilchrist's single gave Waugh the strike back. On 98, he drove the final delivery of the day through cover for four. He leapt in celebration, the crowd roared and Waugh's place in the pantheon of greats was assured. What they said: "That was the most sensational piece of individually constructed piece of cricketing theatre that I have ever seen." Commentator Mark Nicholas. Leg-spinner Shane Warne tormented England throughout his career, sparking collapses and spreading panic for the best part of 15 years. Although his 'Ball of the Century' to Mike Gatting at Old Trafford in 1993 remains his most famous Ashes delivery, Warne's finest moment on home soil was arguably his hat-trick in Melbourne in 1994. The setting was Warne's home ground, the iconic MCG - a month after he had been on a hat-trick in the first Test at Brisbane but failed to remove England number 11 Phil Tufnell. In England's second innings, Phil DeFreitas was lbw playing back to a top-spinner, Darren Gough was caught behind off the glove as he lunged at a big leg-break, and Devon Malcolm - with seven Australians camped round the bat and the crowd roaring - was brilliantly caught by a diving David Boon at short leg. It was the first Ashes hat-trick for 90 years. Boon was mobbed by Warne and his jubilant team-mates and Australia wrapped up a crushing 295-run win moments later. They went on to win the series 2-1 and Warne finished with 27 wickets. What they said: "I closed my eyes and bowled my stock ball - a leg-spinner with a bit more overspin in the hope that it would bounce a bit more." Shane Warne. The legendary Donald Bradman described England's Frank Tyson as the "fastest bowler I have ever seen". Richie Benaud, who witnessed more Tests as player and broadcaster than anyone else, agreed. In an injury-hit career, Tyson burned briefly, but brightest in the 1954-55 Ashes when he was picked ahead of Fred Trueman. Len Hutton's England lost the first Test in Brisbane, but Tyson - playing his first full Test series - was at the centre of a stunning comeback that helped them win 4-1. Hit on the head by rival pace bowler Ray Lindwall in the second Test at Sydney, Tyson took six wickets in the second innings, and he returned figures of 7-27 on a treacherous Melbourne pitch in the third Test. Not without reason was he nicknamed 'Typhoon'. Tyson finished the series with 28 wickets at an average of 20.82, but injuries restricted him to only 11 more Test appearances. What they said: "When he came on I was standing 50 yards back at slip; I was closer to the fence than the stumps." England team-mate Tom Graveney. A decision that Nasser Hussain has never been allowed to forget. Winning the toss in the first Test in Brisbane, England captain Hussain shocked almost everyone by asking the home side to bat first on a true surface and in benign conditions. England bowled poorly, fielded abysmally and Australia ended the day on 364-2 thanks to centuries from Matthew Hayden and Ricky Ponting. England's agony at the Gabba was compounded by an injury to pace bowler Simon Jones, who ruptured ligaments in his knee when he slid to save a boundary. It kept him out of cricket for more than a year. Australia won the first Test by 384 runs, the second and third by an innings and the fourth by five wickets. Only an England win in Sydney prevented a 5-0 whitewash. What they said: "The ball swung a bit at first, but by the fifth or sixth over nothing was happening and the world was closing in on me. I thought to myself: 'Oh God, Nass, what have you done?'" Nasser Hussain.